All faucets, no matter how fancy their exterior, incorporate one of four standard valve mechanisms to deliver water, and use similar systems of nuts and washers to attach them to a sink or wall. For your new faucet, you will need to have the correct number of holes in your sink: three for a two-handle and one or two for a single-handle faucet. Don't forget the extra hole for a spray attachment, if there is one. Wall-mount faucets are attached to stub-outs in the wall and they don't require holes in the sink, but you will need to take extra care when roughing-in, or installing the plumbing. When you are installing or replacing a sink-mount faucet, be sure the rubber gasket that came with the faucet is in place before you apply the washers and nuts to tighten the faucet to the sink. If you enlist the help of a friend to do this, they can hold the faucet to keep it straight, as this is almost impossible to do by yourself. If possible, install the faucet before you put the vanity in place because it is much easier to work from behind than from underneath. If the cabinet is already in place, give yourself some working room by disconnecting the drain pipes. Use an appropriate length of flexible supply hose to connect the faucet to the angle stops. Too short of a hose will make the connection difficult and may cause leaks, while too long of a hose may use up valuable space under the cabinet. Be sure the angle stops are in good working order and don't have any leaks. Reinforce leaky supply-line connections by wrapping Teflon tape around the male connectors of the faucet and angle stops rather than trying to over-tighten the supply connections. Wall-mounts double as faucets and angle stops, so they are easier to install than sink-mounts. Extra care must be taken to ensure that the rough-in pipes are set at the correct depth. Test the faucet depth before you solder the connection and check for leaks before final installation. 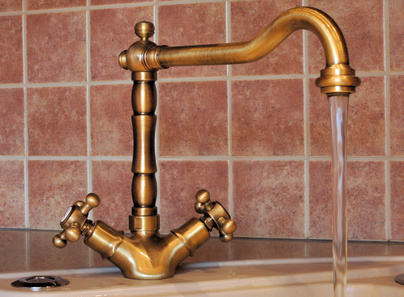 Once the faucets are on, any leaks will be invisible and could cause problems in the wall. Use a wrench for installation of wall mounts because channel locks can bite into the finish and disfigure them.